William J. Evans Jr. was born on April 22, 1876 in Pittsburgh, Allegheny County, PA, the son of William J. and Eva (McKinney) Evans Sr. When William was very young, his father was badly injured in an accident. The boy was admitted on Sept. 15, 1877 to St. Paul Orphanage on Tannehill Street in Crafton Heights near Pittsburgh, where his brothers already were living under the care of Most Holy Father Domenec. He was about age two-and-a-half at the time, and Bishop Domenic agreed to pay some of the boys' expenses, with the mother contributing a dollar a week. A year later, his father died, and William remained in the orphanage. Then when he was age six, on Sept. 12, 1882, after his mother had married George Henry Minerd, William was discharged and rejoined the family. William was united in holy wedlock with Catherine Gilligan (July 4, 1874-1947). She was a native of Pittsburgh and the daughter of immigrants Thomas and Mary (Cavanaugh) Gilligan. The Evanses' offspring were Wilma Evans, Orin Evans, Regis Evans, Bernis Mae Evans, Kenneth T. Evans, William J. Evans III, Kathleen Evans and Mary Lou Harmson. As well, an unnamed son died in 1907 and infant daughter Jean Evans in 1910. William and Catherine first lived in Pittsburgh but by 1914 relocated to New Castle, Lawrence County, PA. Their address was Cumberland Avenue. There, he was a partner in an interior decoration, scenery painting and wallpaper business known as Emery and Evans, located on North Mill Street. Circa April 1915, he received assignments to decorate the First National Bank of Meadville, and also the residence of Judge A.W. Williams of Mercer, PA. In reporting on the new contracts, the New Castle Herald published William's photograph and said he was "successful in being awarded many contracts from other cities which speaks well of the ability of New Castle to compete with Cleveland and Pittsburgh firms." He also was active with the Rotary Club of New Castle. As a Rotarian, said the Herald in the spring of 1915, he "takes an active part in every project set forth for the betterment of the city and county. He is one of a committee appointed by the Rotary club to make plans for participation in the clean-up week which New Castle is going to celebrate in May." William suffered a fall in the summer of 1915 and was hospitalized. He was discharged but spent several weeks at home convalescing. By February 1916, his partnership with Emery had dissolved, and he formed a new firm with John H. Lewis, known as Evans and Lewis, based at 226 East Washington Street, apparently in a second floor business above a Clutton's store. He also served in 1916 as treasurer of the Lawrence County Civic League, helping to raise funds for the Shenango Valley Hospital. The Evanses held a community party on their lawn in July 1916, serving ice cream, lollipops and watermelons for some 65 girls and boys. A related story in the Herald said that he had originated these parties while in Pittsburgh, which had grown from 15 children to 500, and that he hoped to hold similar ones regularly in New Castle. Reported the Herald, "Athletic exercises, as well as the 'feeds,' mark the parties, the children being taught to jump, tumble, pitch horseshoes and other sports.... Mr. Evans and his conspirators also plan to inaugurate swimming lessons for the children of the neighborhood. It is planned to locate some favorable spot along the Neshannock, clean up the shore at that place, white-wash the rocks, erect bath-houses, and make a suitable swimming place." In May 1917, he was named by Rotary Club president George Winters to chair a Civic Public Bathing Beach Committee, with a site selected along the river at Rural Avenue. Fate intervened in William's rising career path in December 1918, when he suffered what the Herald called "a serious nervous breakdown" following a case of influenza and pneumonia, and that his condition was "quite critical." The decision was made for him to go to West Farmington, OH, likely to his mother's home, to recuperate further. Apparently feeling better, he and Catherine hosted a visit to their home in February 1919 by their nephew, George Ellsworth Virtue, who had completed military service in France during World War I. In August 1919, William removed himself from direct business ownership and accepted a position as vice president with Rice & Associates of Youngstown, Mahoning County, OH. In making this move, William was again pictured in the Herald, which noted that the new firm was in the fields of carpeting, drapery, furniture, decorating, uphostery and scenery painting. "Mr. Evans will be remembered for some of the fine decorating done here," the Herald said. "One of the best known works was the painting of the scenery for the senior play at the High school in 1918." William's first assignment with the Rice firm was to find a new building. They decided on a three-story structure on West Federal Street with 1,700 feet of floor space for the business's seven departments. The Evanses remained in Youngstown for the balance of their lives. Their address in the late 1940s was 520 Ferndale Avenue. They were members of St. Patrick's Catholic Church. Following retirement, William earned income in his later years as a safety inspector for Youngstown Welding and Engineering company and as a watchman at a local steel mill. Burdened with heart failure over the last 28 months of her life, Catherine succumbed at home at the age of 71 on Sept. 22, 1947. Her remains were lowered into repose in Calvary Cemetery in Youngstown. William outlived his spouse by three years and moved to the address of 144½ Carroll Street. At the age of 74, suffering from cardiovascular hypertension, William died at home on April 25, 1950. Bernie Mae Evans was the informant for his death certificate. Interment was in Calvary Cemetery in Youngstown. 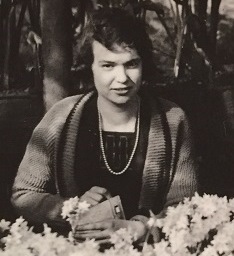 Daughter Willma Evans (1899-1956) was born in 1899. In about 1927, when she was 28 years of age, Willma was united in holy matrimony with 28-year-old Thomas E. "Tom" Barrett (Nov. 4, 1897-1978), a native of Youngstown, Mahoning County, OH, and the son of Thomas J. and Mary E. (Cotter) Barrett. Their two children were William "Bill" Barrett and Edmund "Ned" Barrett. United States Census records show the Barretts making their residence on Market Street in Youngstown in 1930 and by 1935 on the city's Ferndale Street. Thomas' occupation in 1930 was as clerk in a Youngstown steel mill. By 1940, he had been promoted to "chief clerk" in the mill. Willma passed away in Youngstown on April 1, 1956. Thomas outlived his wife by more than two decades. He succumbed on Sept. 2, 1978, at the age of about 81. Son William "Bill" Barrett (1931-living) was born in 1931. Son Edmund "Ned" Barrett (1932-1977) was born on June 9, 1932. He passed away in October 1977, at the age of 45. 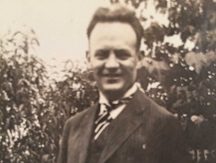 Son Orin Francis Evans (1899-1949) was born on Sept. 7, 1899 in Pittsburgh. When he was just 17 days old, he was baptized in the city's St. Paul's Cathedral, sponsored by Thomas and Bridget Gilligan, with Rev. Stephen Walsh administering the rite. Following in his father's footsteps, Orin learned the skill of interior decoration. 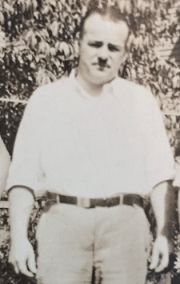 In 1926, when he was 27 years of age, Orin married 27-year-old Eulalia Cahill (May 30, 1899-1994), daughter of William P. and Bessie (Flanagan) Cahill of Willard, Huron County, OH. Family lore has it that Orin fell in love with his future wife when they were but children in grade school together. The couple produced two known children, Joseph S. Evans and Orine Haacke. The couple followed Eulalia's family to Cincinnati, Hamilton County, OH, where they established a home. There, Orin had charge of the Decorating Department of Kreimer's home furnishings store at 128 East Fourth Street. Advertisements for the store, including Orin's name, were printed in the Cincinnati Enquirer circa 1928. In the late 1940s, the Evanses dwelled in Cincinnati at the address of 2805 Madison Road. Their home contained a small Catholic shrine which he had designed. Heartbreak enveloped the family in early 1949 when Orin was diagnosed with kidney cancer. The illness spread and he succumbed at home just a few months later on April 29, 1949, at the age of 49. Burial was in Calvary Cemetery in Cincinnati, following a requiem high mass held at St. Mary Church in Hyde Park. A death notice was published in the Enquirer. Eulalia remained in Cincinnati as a widow, making her home at 1960 Madison Road. She supported herself working as a medical telephone operator at the Academy of Medicine. She occasionally traveled to Kansas City to visit her brother Cyril Cahill. Having been admitted to Saint Margaret Hall in Cincinnati with hyperetensin and hardening of the arteries at the age of 94, she passed away on Jan. 2, 1994. An obituary in the Enquirer numbered her surviving grandchildren as eight and great-grandchildren as a dozen. She joined her husband in eternal repose in Calvary Cemetery. Son Joseph S. Evans ( ? -1993) resided in Cincinnati. In the spring of 1961, he was engaged to wed Charlene Ann Wilking ( ? - ? ), daughter of George Wietmarschen of Reading, OH. But he called off the wedding, and remained single for the rest of his life. He is said to have been very active socially and enjoyed antique automobile clubs and square dancing. He died on June 13, 1993. Daughter Orine Evans (1929- ? ) was born in about 1929. On May 31, 1951, in a ceremony held at St. Mary's Catholic Church in Hyde Park near Cincinnati, the 22-year-old Orine was joined in matrimony with 25-year-old Paul Robson Haacke (Sept. 7, 1927-1990). He was the son of Amandus O. and Gertrude (Robson) Haacke. The couple produced eight children -- Paul Henry Haacke, Robert Robson Haacke, Christopher A. Haacke, Mary Susan Haacke, Mary Kathleen Maifield, Mary Elizabeth Milam, Mary "Ann" Haegle and Mary Johanna Brosey. The family dwelled at 1006 Winding Way in Covington, KY. For many years, Paul was employed as a sales marketing representative for the Bureau of Engraving in Minneapolis. Paul passed away Nov. 28, 1990. Mass of Christian burial was held at St. Ann Church, with burial in St. Mary Cemetery at Fort Mitchell, KY. In an obituary in the Cincinnati Enquirer, the family asked that any memorial gifts be made to St. Ann Church or to Northern Kentucky Right to Life. Grandson Paul Henry Haacke resides in Dallas, TX. Grandson Robert Robson Haacke dwells in Alexandria. Grandson Christopher A. Haacke lives in Park Hills. Granddaughter Mary Susan Haacke makes her home in Covington. Granddaughter Mary Kathleen Haacke married (?) Maifield. She resides in Edgewood. Granddaughter Mary Elizabeth Haacke wedded (?) Milam. Her home is in Fairfax, VA.
Granddaughter Mary "Ann" Haacke was joined in marriage with (?) Haegle. They live in Ludlow. Granddaughter Mary Johanna Haacke was united in wedlock with (?) Brosey. She dwells in Fort Wright. Son Regis Evans (1904-1937) was born in September 1904 in Pittsburgh. Regis is believed to have authored a poem for a contest sponsored by the New Castle Herald. His entry, published on March 1, 1920, read: "A kitchen cabinet I'd like to secure, Both ware and tear it will have to endure, I will look in the Herald's A.d. V's, And I'll find one there that is sure to please." He married Janet McDonald ( ? - ? ). The couple eventually divorced. Regis resided in Youngstown in the 1920s and mid-1930s. He flew airplanes and was considered by the family as a daredevil. Stricken with a form of syphilis known as "taboparesis," Regis was admitted to Massillon State Hospital in Massillon, Stark County. He died there at the age of 33 on Nov. 2, 1937. His remains were interred in Youngstown. Daughter Bernis Mae Evans (1908-1996) was born on July 24, 1908 in Pittsburgh. Her name has been misspelled as "Bernice" over the years. 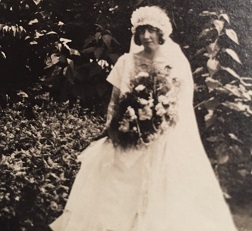 In August 1926, at the age of 18, she and her brothers Regis and William traveled to Cincinnati to attend the wedding of their brother Orin to Eulalia Marie Cahill. She apparently never married. When the federal census enumeration was made in 1940, the 31-year-old Bernis lived under her parents' roof in Youngstown. Her occupation was listed as "teacher - parochial school." For many years, she continued her work as an educator in the Diocese of Youngstown. Bernis passed away in Youngstown on Feb. 15, 1996, at the age of 85. Son Kenneth T. Evans (1911-2004) was born on Aug. 8, 1911 in Pittsburgh. In his growing up years, he moved with his parents and siblings to New Castle, Lawrence County, PA and Youngstown, Mahoning Couinty, OH. While in Youngstown, he was a member of the choir of St. Patrick's Church, the Knights of Columbus and the Kiwanis Club. Kenneth was wedded to Betty Louise Vanderbilt ( ? - ? ). Their three offspring were Richard P. Freeze, Janice M. Roberts Roll and Robert K. Evans. They made their home in Chagrin Falls, OH and in about 1960 relocated to Mentor, OH. He was employed with the elevator/escalator division of Westinghouse Electric and was a member of the International Elevator Union. When time permitted, he loved to fish and boat. At the age of 92, Kenneth passed away on April 15, 2004, as a patient in Hospice House of the Western Reserve in Cleveland. In an obituary in the Willoughby (OH) News-Herald, the family asked that any memorial donation be made to the Hospice of the Western Reserve in Cleveland or Mentor. Son Richard P. Freeze married Rosemary Timbrook and in 2004 made their home in Tarpon Springs, FL. Daughter Janice M. Roberts wedded Robert C. Roll and lived in Chardon, OH. Son Robert K. Evans was joined in matrimony with Arlene Lach. Their home in 2004 was in Trophy Club, TX. Son William Joseph Evans III (1914-2000) was born on Nov. 9, 1914 in New Castle, Lawrence Coiunty. William relocated as a young man to Harrisburg, Dauphin County, PA, where he secured employment as a manager. His address was 53 North 13th Street. On June 14, 1941, when he was 27 years of age, William was joined in holy wedlock with clerk Emily "Catherine" Fraser ( ? - ? ), daughter of Russel and Pearl (Driscoll) Fraser of Youngstown, OH and a native of Worthington, IN. The nuptials were held in Wrightsville, Dauphin County, PA. The couple's only child was Maryann Weybrecht. The family made their home in Lakewood and Youngstown, OH for many years. William spent four decades of employment with Westinghouse Elevators in Cleveland, and he retired in 1985 as superintendent of service and installation. In retirement, the Evanses relocated to Euclid, OH. He co-founded the Don Bosco Society in Cleveland, a Roman Catholic religious organization founded in the 1800s to assist poor children. He also was a board director and sponsor of Big Brothers Big Sisters. He also was a member of the Holy Name Society and served as an usher at St. Rose Church in Cleveland. William passed away at the age of 85 on May 22, 2000 while a resident of Aristocrat Nursing Home in Lakewood. Funeral services were held at St. William Church in Euclid. The family asked that any donations in his memory be made to Hospice of the Western Reserve or to Catholic Charities. Daughter Maryann Evans (1948-living) was born in 1948. She wedded Richard C. Weybrecht Jr. (1949-2016), son of Richard and Patricia Weybrecht. Their children are Jason Weybrecht and Jennifer Chestnut. The Weybrechts made their home in Willoughby, OH. Sadly, possibly afflicted with leukemia, Richard died at the age of 67 on Nov. 3, 2016. The Cleveland Plain Dealer said in an obituary that a mass of Christian burial was held at Ss. Robert and William Parish in Euclid. Daughter Kathleen Evans (1918-1982) was born on Feb. 16, 1918. She was united in matrimony with Milton Henry Meech (March 30, 1915-1997). They were the parents of a son, George Meech. The Meeches maintained a home in Youngstown at the address of 2144 Coleman Drive. She died in or near Youngstown at the age of 64 in 1982. Funeral services were held in St. Christine Church, with interment in Calvary Cemetery. Milton lived as a widower for another 15 years. He passed into eternity on March 3, 1997 in Youngstown. Daughter Mary Lou Evans (1919-1957) was born in 1919 (or 1921). On June 9, 1951, when she was about age 32, Mary Lou was united in matrimony with 29-year-old Norman Harmson (1922- ? ), son of William and Mary (Anderson) Harmson. Their wedding was held in Mahoning County, OH. The Harmsons are believed to have had a son, James Harmson (a.k.a. "James Lloyd"). Mary Lou died in 1957. Son James Harmson (1952-1986) was born on Feb. 16, 1952. He may have changed his name in adulthood to "James Lloyd." Sadly, he died at the age of 34 on April 15, 1986. Mary Ann (Haacke) Haegele as contributed content and images for this biography.